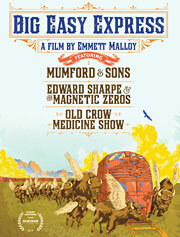 Big Easy Express is a vivid documentary directed by Emmett Malloy that celebrates the bond created between three of the independent music scene's brightest lights - Mumford & Sons, Edward Sharpe & The Magnetic Zeros, and Old Crow Medicine Show - as they traveled aboard a vintage train for an eight-day journey through the vibrant landscape of the American Southwest, making six stops to perform for jubilant crowds from Oakland to New Orleans. Big Easy Express tells its story through wall-to-wall music and the lyrical beauty of the passing landscape, enabling the audience "to see the country the way people saw it more than 100 years ago," as Zeros lead singer Alex Ebert says. After the screening, Ebert, along with director Emmett Malloy and producers Bryan Ling and Mike Luba, will participate in a panel discussion about the film, moderated by Vice President of the GRAMMY Foundation and MusiCares, Scott Goldman.